NEW! Hi - Tech Competition Cleaner and Protectant. Designed exclusively for competition use, RaceSpray harnesses the power of nearly 30 different ingredients to safely clean, degrease, and protect against debris commonly encountered on Motorsport Curcuits. Developed in the USA, RaceSpray has been tried and tested for nearly 10 years under an alternative product name. GLISTEN has now acquired this incredible product to offer Australians a new level of convenience in motorsport. 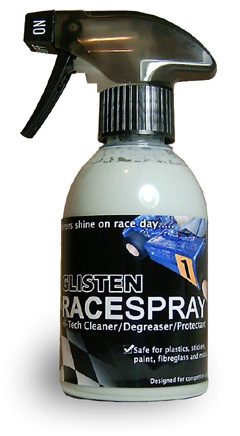 RaceSpray is perfect to use in the Pits to clean and protect, or aid visual inspections of wear and breakage. RaceSpray will also come in handy on rainy days where it can be used to protect visors, windshields, and other visual shields against water droplets by resisting and driving water away. Order your handy 250ml bottle today and try our speedy delivery service yourself! NEW! 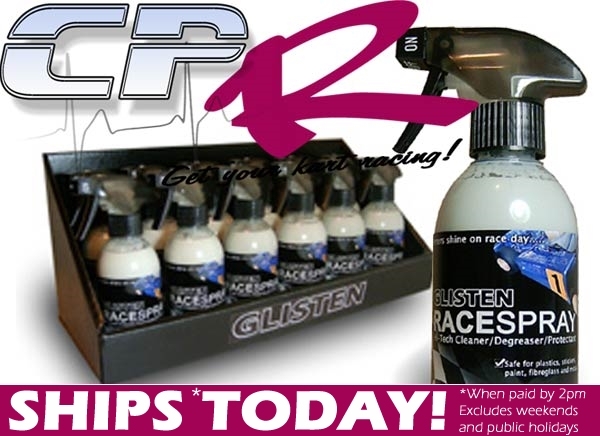 RaceSpray - Hi Tech Motorsport Cleaner and Protectant. Spray on to help resist and remove tyre-marks, drives off water (off helmet visors, windscreens etc) and resists oily fumes. Removes grease and chainlube. The perfect aid when inspecting for wear and breakage. FAST & EASY to use! Completely safe for all surfaces! Hi Paul, just tried your product yesterday at the track. I was a bit sceptical that anything could actually get tyre marks off sidepods etc. So I was very pleased and surprised that it did just that!!! I demonstrated to a few people at the track, so I reckon you might be getting a few more orders. Excellent product, thanks heaps.